If you take the SkyTrain, tonight then you’ll no doubt encounter all manner of costumed commuters en route your spooky destination of choice. You may even spot someone dressed up as Jason Voorhees, the machete-wielding maniac from the iconic Friday the 13th franchise. If so it wouldn’t be the first time the hockey-mask clad baddie had graced our city’s public Transit. 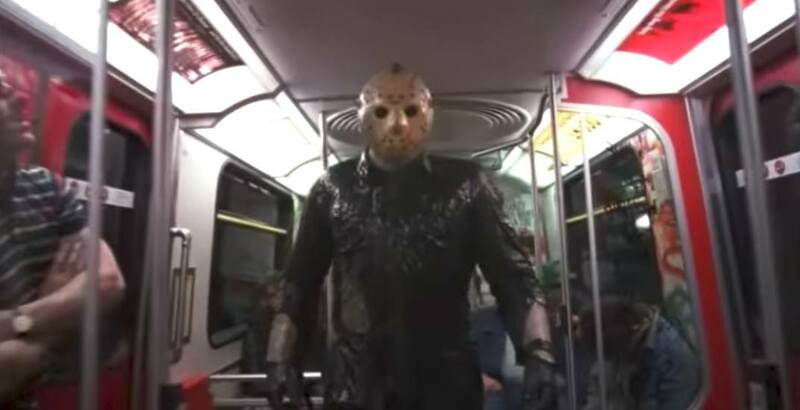 In fact, Jason was terrorizing SkyTrain passengers all the way back in the 1989 slasher Friday the 13th VIII: Jason Takes Manhattan. In a clip that was posted this morning by an eagle-eyed Vancouver Redditor, you can see Jason stalk his way through Granville SkyTrain station before boarding a train that’s standing in for New York’s subway, complete with period-appropriate graffiti tags.